Chewable tablets to relax your dog during travel, training, thunderstorms and stressful situations. Pork liver flavoring. Also available in a 3-pack. Do not give to animals younger than 16 weeks. How much does my dog need to take? Daily recommend amounts are listed by weight, so make sure you have a current weight on your dog for best results. The recommended daily amount starts at 1 pound and goes up from there. Please see the "Recommended Usage" for specific recommended amounts. Make sure to give the recommended usage amount all at once, 45 minutes to an hour before the stressful event. Do not give to puppies under 16 weeks of age. 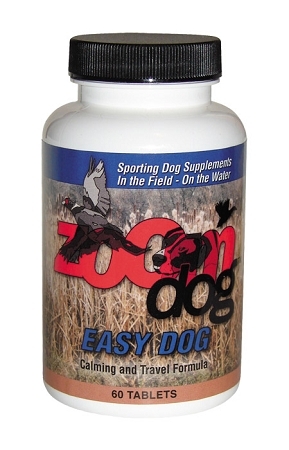 What is Easy Dog recommended for? 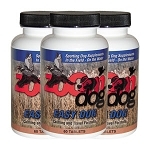 Easy Dog can be used for events such as the Fourth of July, storms, grooming, vet visits and dogs who don't travel well. It is recommended to be used in conjunction with training. If it is necessary to give Easy Dog over a longer period of time, 2 days off are recommended after 7 consecutive days of use. Can my dog use Easy Dog if they are on prescription anti-anxiety or antidepressant medication? It is not recommended to use Easy Dog in conjunction with SSRI's. Please consult your veterinarian.